Definition: The theoretical measurement of the amount of land and water a population requires to produce the resources it consumes and to absorb its waste under prevailing technology. There are vast disparities in countries ecological footprints (measured in global hectares). Fossil fuel consumption is a major factor for most countries since many developed economies rely heavily on oil and gas for transportation, heating and electricity generation. Developed countries tend to have high per capita energy consumption due to the levels of car ownership and devices in homes (TVs, dishwashers, ovens, air conditioning etc). Explain why the part of the definition about "under prevailing technology" is significant. Explain why on the map China, the USA and India have the largest ecological footprints. In the chart below the map UAE tops the per capita ecological footprint rankings, suggest reasons why. Watch video 4.1; how can cities reduce the ecological footprint? Underpopulation: when there are not enough people to make full use of the resources and technology of the place they live in. Canada can be considered underpopulated because it could increase its population but still have a high standard of living. Canada exports food, oil and water. Overpopulation: an area that experiences decreasing standards of living due to population growth. Resources are being spread more thinly between the people (food, jobs, technology, services, energy). Rwanda is a good example of a country that became over populated and conflict led to a very violent civil war which suddenly decreased the population. 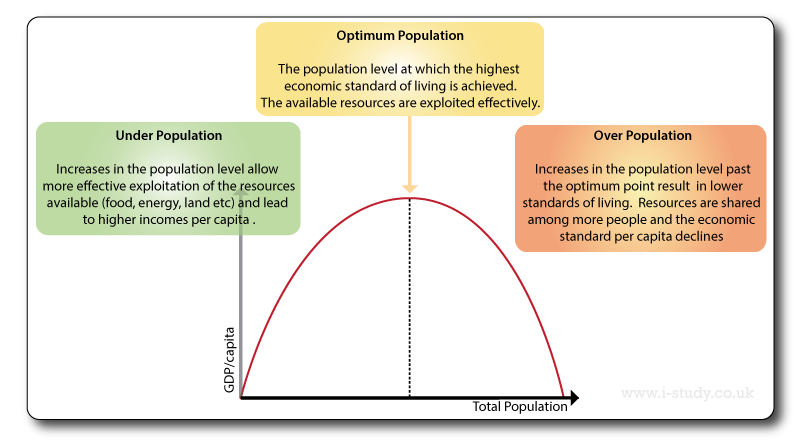 Optimum population: the level of population at which the resources are most effectively exploited to give a high standard of living. Advances in technoogy often allow us to use resources more efficiently or extract previously unrecovarable resources - so the optimum population level is dynamic and is likely to change over time. Malthus argued that population growth would outstrip the rate at which humans could increase food production. This would eventually lead to situations in which food resources became scarce and ultimately lead to an event that would reduce the population level - a war (over resources), disease or a famine. He called these population reductions 'checks'. The main limitations of his theory are based on his assumption that the main way to increase food supplies was through farming more land. This has proved to be unfounded as technology and machinery have vastly increased the yields of food that we can produce from a given area of land. Developmnents such as the green revolution have vastly increased global food production. Club of Rome - these argue that we cant keep increasing the food supply and that the green revolution is unlikely to be repeated. In fact in many places soil degradation and increasing freshwater scarcity are going to make increasing the food supply much more difficult. Boserup - these argue that we will find ways to increase food production to meet the needs of increasing populations. That scarcity will drive inovation and new technologies to allow continued population growth. Genetic modification of crops, laboratry grown meat products etc. 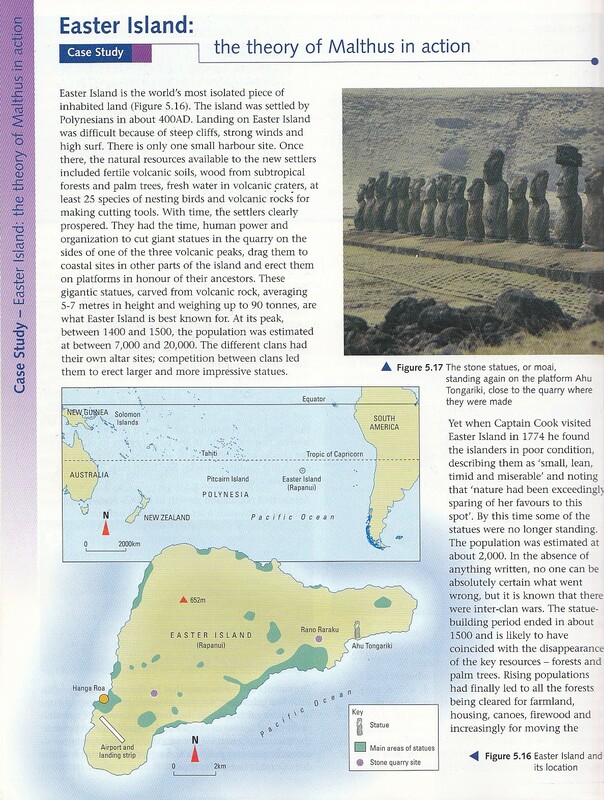 CASE STUDY: Easter Island - overpopulation? Attenbrough Easter Island & population decline video. 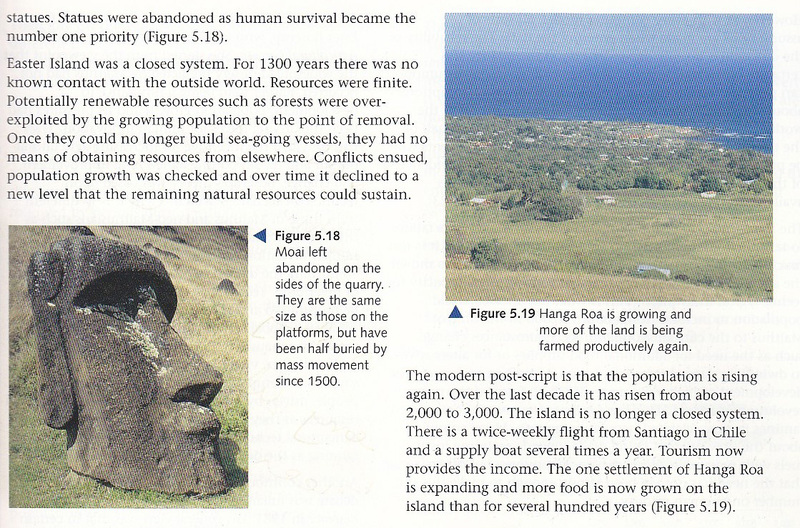 Homework: Explain how & why Easter Island can be used to exemplify the theory of Malthus. The last century witnessed the world become increasingly dependent on oil. Food production, industry, transport, plastics all depend on oil in one way or another. Consider the role of oil in our modern way of life and the impact that it is having on the environment. Describe what the tar sands oil reserves are? Significant concern exists about the high environmental impact of extracting oil from the sands. Describe the main concerns. Why is Canada allowing a fragile ecosystem to be severely damaged to extract oil? Shale gas and oil offer the potential of vast new fossil fuel reserves that can be extracted. The exploitation of these reserves in the USA has enabled it to become a net energy exporter aswell as reducing the price of electricity. Describe how the shale oil and gas are extracted. Explain why there are many groups and individuals that strongly oppose the process. 1) UK & Argentine tensions are increasing over who has the rights to oil reserve in the Falkland Islands. 2) Spain & Argentine tensions over oil industry nationalisation. Read this article & make brief notes. 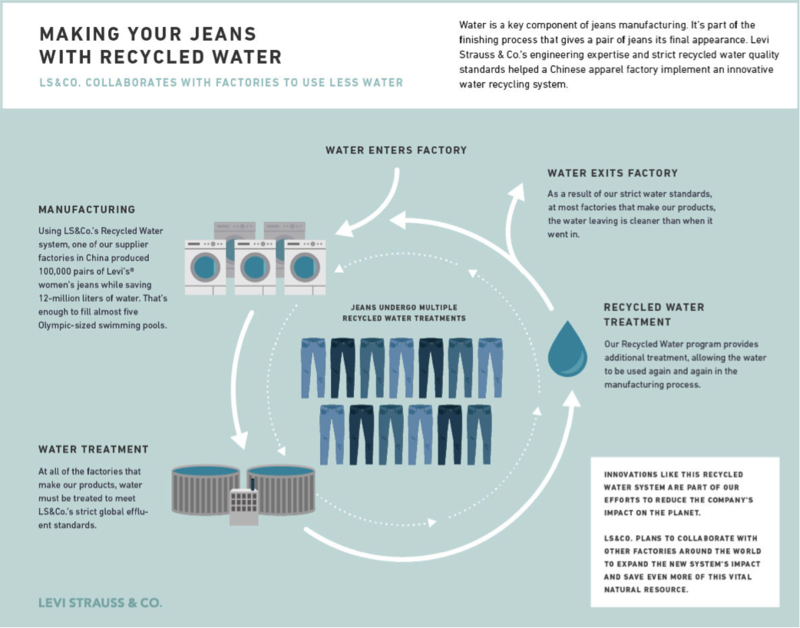 Levis have made significant progress in reducing the resources used in the production of their jeans. Manufacturing jeans has traditionally used large quantities onf water, not just in the fabric prouction but also the dying processes. Use figures 4. and 4. aswell as the links below links to make case study notes. 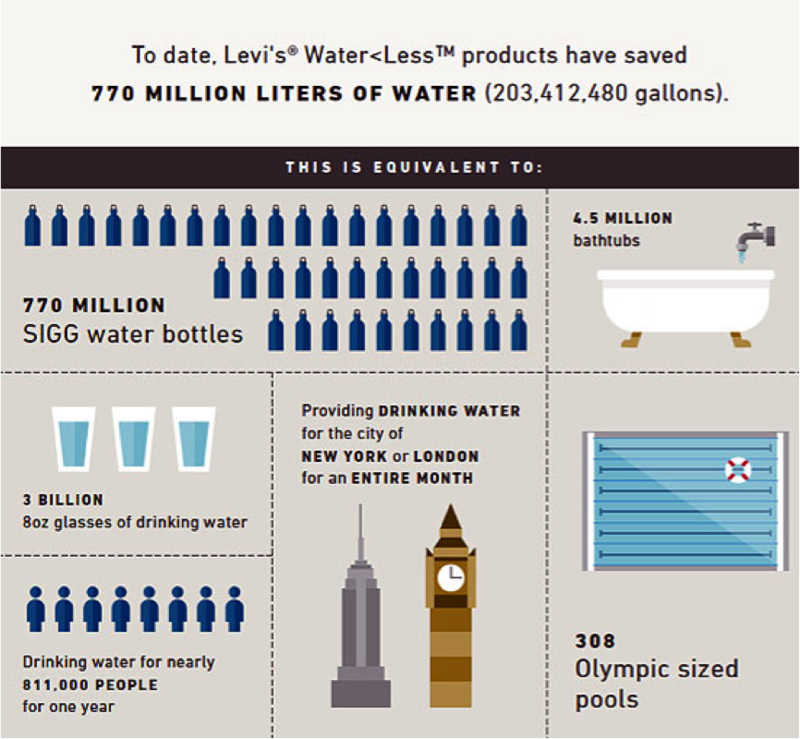 To what extent have they achieved sustainability in terms of water use. Concusion - do you think they will suitably solve the water issue? The public water utility company Acosol has made a firm commitment to sustainable tourism and respect for the environment. Its key initiatives include providing recycled water for the irrigation of golf courses and garden areas, operating a desalinisation plant and linking up river basins and resoviours to balance water extraction. To guarantee supply to the whole Costa del Sol, Acosol has carried out work to inter-connect catchment areas between Campo de Gibraltar, Río Verde, Málaga and Axarquia. Acosol is therefore able to transfer water from one catchment area to another, thus balancing resources. This is an important point in achieving proper management of water resources. During 2014, Acosol supplied 5,676,028 cubic metres of recycled water to golf courses. The Marbella desalination plant was commissioned in 2005 and is one of the largest in Spain. Spain has more than 700 desalination plants for both saltwater and seawater. The Marbella plant has eight production lines and a capacity for producing 56,000 m³ per day (2400 m³/hour), which means an annual supply of around 20 cubic hectometres. Washing machines and dishwashers always full, as they use the same amount of water independently of the load of clothes or utensils, respectively. So, filling them with the maximum load can mean savings of up to 40 litres of water and optimise water consumption. Closing taps properly after use, as just one dripping tap can use more than 90 litres of water a week. Taking a daily five-minute shower, instead of a bath, can help save up to 400 litres of water a week. Irrigating during the first and last hours of the day – albeit not in excess – can also achieve considerable water savings, as this reduces loss due to evaporation. Not using the toilet as a wastepaper basket. If you place a wastepaper basket in the bathroom you will avoid flushing the toilet every time you use the toilet as a rubbish bin.